easyJet transformed air travel in Europe by introducing the model of budget airliners to holidaymakers and business travellers. easyJet fly from 18 airports in the UK so you will not be far from a cheap flight taking off! Wherever you are looking to go in 2019, easyJet can help you get there cheaply and with these easyJet voucher codes you can save even more money. Use the travel discounts and promotions on this page to leave money in your pocket when you book your next holiday. Here are the latest tested and valid easyJet voucher codes, deals and promos. Get £100 off your ski holiday with this voucher code at easyJet Holidays. Save money and hit the slopes for less with this discount code. We check the easyJet deals and codes every day to make sure they are still working. If you have any issues then please let us know so that we can look in to it. If there is a code needed to redeem an offer then you will be able to enter that at checkout. Check the total amount that needs to be paid to ensure that the discount has been applied. The budget airline do sometimes release student promo codes for those who need a break from studying! We will update this page with any relevant offers and codes as soon as they are available. easyJet is a great choice for student budgets as they have the best value flights in Europe. It is easy to enter your promo, discount or voucher code on the easyJet website. Once you have added your booking to your basket, you will see a voucher code entry box at checkout. Once you have clicked, “apply” you will be able to see how much money you have saved. Tip: if the voucher code isn’t working, make sure you have entered the code all in CAPS. Take a cabin bag (dimensions are below). You can pack enough for a long weekend away in a bag without a problem! Even if the cabin is full, you will not be charged to put your bag in the hold so it is free for holidaymakers. Sign up to easyJet Plus and pay an annual fee to be able to take on 2 bags in the cabin. This is a good idea for frequent flyers. You can fly with easyJet from the following airports in the UK: Aberdeen, Belfast International, Birmingham, Bournemouth, Bristol, Edinburgh, Glasgow, Inverness, Isle of Man, Jersey, Liverpool, London Gatwick, London Luton, London Southend, London Stansted, Manchester, Newcastle and Southampton. If you are looking to find your nearest airport then head to Google Maps. You are allowed to take a cabin bag on to the plane with you. The maximum bag size you can carry on to the plane is 56x45x25cm including all handles and wheels. If the cabin is too full, the airline may need to put your bag in the hold and they do this free of charge. easyJet Plus members can take on 2 bags and as they board first, they are able to make sure that there bags make it on the flight and stored in the cabin. If your bag is bigger than the dimensions above then you will need to check the bag in. 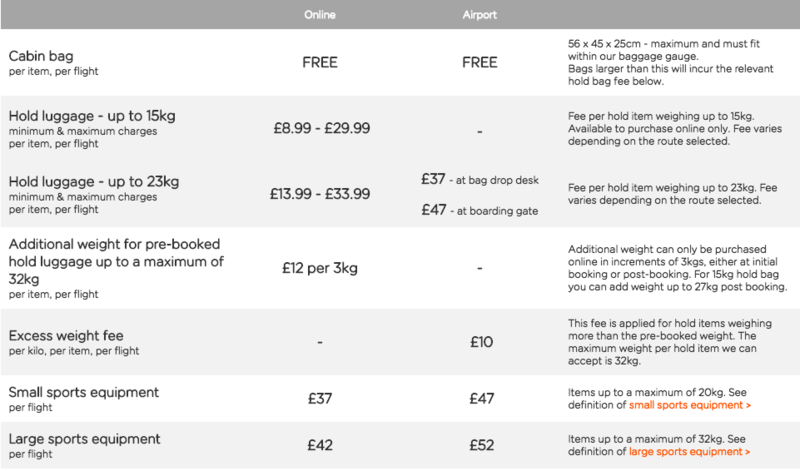 The can see the easyJet baggage fees below. You will notice that it is cheaper to book online than it is when you arrive at the airport. It is easy to save money when you book with easyJet. Searching for a voucher code or holiday deal for easyJet is a good place to start and means you can save money on the total holiday price. You should sign up to the easyJet newsletter to be the first to hear about offers as soon as they are released! To give you peace of mind that you aren’t paying too much for your flight, easyJet offer a price match guarantee. If you find the same holiday for less then easyJet will match the price and give you an additional £10 off. It pays to be a deal hunter! Full terms and conditions are here. How can you contact easyJet? You can get in touch with easyJet on Facebook and Twitter. Remember to keep checking back for new travel deals and online easyjet voucher codes!